Former Kolles Audi driver Andy Meyrick will drive Dyson Racing's Lola-Mazda in the three American Le Mans Series endurance races this year. The team is scaling back to a single car for Chris Dyson and Guy Smith this season, with Andy joining them for the Sebring 12 Hours, Laguna Seca and Petit Le Mans. Driver and team sporting director Dyson said the 24-year-old Briton had already impressed in two winter tests for the squad. "He impressed us greatly with his speed, maturity and general approach to the team," said Dyson. "It was a very good fit straight away. 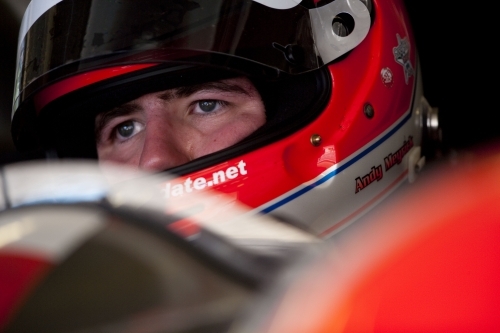 "We welcome him to American sportscar racing and expect he will showcase his talent quickly. It will not take long for the fans to see what we saw when he first got behind the wheel." Andy added that he was thrilled to join a team with Dyson's heritage. "They have an amazing history in endurance racing in the USA," he said. "Both Rob and Chris Dyson are very passionate about their racing and I am very grateful to them for the chance to be in the #16 car with Chris and Guy. "It is an ideal situation for me to make my debut in the ALMS. Chris first invited me to test late last year and our focus has been to secure this drive ever since. The Mazda Lola is a great package and I am really looking forward to the challenge of Sebring and the other events." Marino Franchitti and Butch Leitzinger, who shared Dyson's other entry last year, have already found new employment with Highcroft Acura and the returning Alex Job GT squad respectively.